Size - Medium 0,9mm Package - ~42cm-0,6gr (gross weight 1,1g) Specification - french wire, color - Silver Country of origin – Pakistan.. Size – 87x14mm, Package - 1pc (gross weight 4g) Specification - plastic tube, approximate beads quantity 11/0 up to 12gr., 15/0 up to 11,7gr., Delica 11/0 up to 11,8gr. Country of origin – USA.. Size - Medium 0,9mm Package - ~42cm-0,6gr (gross weight 1,1g) Specification - french wire, color - New Gold Country of origin – Pakistan.. Size - Medium 0,9mm Package - ~42cm-0,6gr (gross weight 1,1g) Specification - french wire, color - Gold Country of origin – Pakistan.. Size - Package - 5g (gross weight 5,5g) Specification - japanese seed beads Half TILA, color - Medium Blue Iris (455) Country of origin – Japan.. Size - 16mm Package - 1pc (gross weight 2,2g) Specification - 1122 Swarovski Rivoli, color - Crystal Vitrail Medium Country of origin – Austria.. Size - 18mm Package - 1pc (gross weight 3,4g) Specification - 1122 Swarovski Rivoli, color - Crystal Vitrail Medium Country of origin – Austria.. Size - Package - 5g (gross weight 5,5g) Specification - japanese seed beads TILA, color - Medium Blue Iris (455) Country of origin – Japan.. 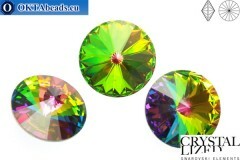 Size - ss47 (~10mm) Package - 1pc (gross weight 1g) Specification - 1122 Swarovski Rivoli, color - Crystal Vitrail Medium Country of origin – Austria.. Size - 14mm Package - 1pc (gross weight 1,5g) Specification - 1122 Swarovski Rivoli, color - Crystal Vitrail Medium Country of origin – Austria.. Size - 12mm Package - 1pc (gross weight 1g) Specification - 1122 Swarovski Rivoli, color - Crystal Vitrail Medium Country of origin – Austria.. Size - 6mm Package - 12pc (gross weight 3,4g) Specification - czech crystal beads, color - Crystal Vitrail Medium Country of origin – Czech Republic.. Size - 8mm Package - 6pc (gross weight 4g) Specification - czech crystal beads, color - Crystal Vitrail Medium Country of origin – Czech Republic.. Size - 11/0 1,6mm Package - 5g (gross weight 5,5g) Specification - seedbeads Delica, color - Lined Crystal Medium Blue Luster (DB243) Country of origin – Japan..